BBC NEWS | Health | When should treatment be stopped? The cases of Luke Winston-Jones and Charlotte Wyatt case have triggered a debate about how long doctors should keep treating patients when they are seriously ill.
A High Court judge ruled that Luke, who has the rare genetic condition Edwards syndrome, should not be resuscitated should if his condition worsens. His case follows that of baby Charlotte Wyatt. Earlier this month, a High Court judge ruled in favour of doctors who argued the premature 11-month-old girl's quality of life would be so poor that she should not be resuscitated if she stops breathing. Her parents had appealed to Mr Justice Hedley during the two-day hearing last week that everything should be done for her as she was a "fighter". But doctors told the court her life would be dominated by pain if she kept being treated. It was the first time a case like this has been held in an open court. And with medical advances being made all the time, doctors are facing the difficult question about whether it is right to stop treating desperately ill people. Richard Nicholson, editor of the Bulletin of Medical Ethics, told BBC News Online that during the 1980s and 1990s there was almost a competition among doctors to keep premature babies alive. "One of the substantial side effects of medical advancements is that we can keep the body alive almost regardless of how severely damaged it has become." And he acknowledged the same sort of issues were cropping up in the treatment of elderly and terminally ill patients. Dr Sarah Jarvis, a GP who has seen a number of cases where people are suffering and in constant pain, told BBC Five Live society was struggling to keep up with science. 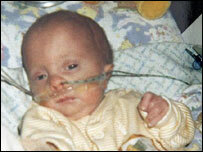 "We have to remember 10 years ago there would have been virtually no prospect of a baby born at this stage surviving. "The problem is medical advances are galloping ahead so fast that we have reached the stage where we are keeping babies alive when perhaps 50% are going to have profound neurological difficulties." But she insists the Charlotte case was different from the debate about euthanasia. "Euthanasia is actively helping to end someone's life and that is illegal in this country. "There is a big difference between that and not resuscitating." Anthony McCarthy, from the Linacre Centre, a health care ethics organisation linked to the Catholic Church, said: "We probably do not know enough about the doctors intentions to know whether it is a case of euthanasia or not." He also believes the case has opened up the debate about whether parents or doctors should have the final say on treatment. "Parents should have the first say but parents are not always infallible. "It is possible that parents may want to continue treatment that may be burdensome." Doctors have the right to refuse to treat a patient if they feel it is in the person's best interests - although if the patient's family disagree the case can end up in court. Dr Michael Wilks, of the British Medical Association's ethics committee, said the decision is taken if the treatment serves no purpose or if the quality of life is deemed to be so low that it is not beneficial. He said: "A doctor's job is to make clinical judgements about whether treatment is appropriate or not. If it is not appropriate it should be withdrawn." And he said while it was difficult, the public should also consider the wider implications of giving treatment. "Every time we give unnecessary treatment we spend NHS resources and deprive someone else of these resources."